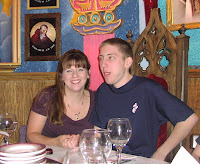 Before Ahren left for the marines on the 20th, the entire family went to Buca diBeppo for a nice farewell dinner. The meal was fabulous! We reserved the Pope Room and Ahren got to sit in the pope throne. On our table was a huge lazy susan with the a statue of the pope's head. The food was placed on the lazy susan as a buffet style. The pope's head spun around when everyone was dishing out the food. Thank you to all who were able to join us (Ahren, Todd, Tami, Zachary, Brandon, Judy, Stan, Gene, Nancy, Tiffani, Billy, Kyle, Chad, Heather, Max, Morgan and Mommom Ritschard). good luck Ahren! We'll be thinking of you! 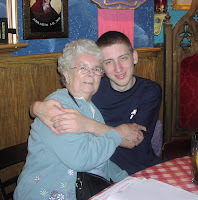 Love the photo of Ahren with Mommom! I wasn't sure when Ahren was leaving. Please wish him well from us all here! Gosh, he has turned into a handsome man!